Did Keanu Reeves Help Pay for a Stranger's Kidney Transplant With an Envelope of Cash? Did Keanu Reeves Help Pay for a Stranger’s Kidney Transplant With an Envelope of Cash? Two unrelated photographs were circulated on social media along with the a fictional story about actor Keanu Reeves' paying for stranger's kidney transplant. Keanu Reeves gave an envelope of cash to a stranger in order to help pay for a kidney transplant. Frequent internet users have likely come across at least one story about the generosity of actor Keanu Reeves. Perhaps it was the video of the Speed star giving up his seat on the subway, or maybe it was a report about his involvement with charitable causes such as PETA, or his donations to fund children’s hospital and cancer research. Or maybe it was the story of how Keanu bought motorcycles for the stuntmen after filming The Matrix. Or, most likely, it was the (exaggerated) tale of how the actor gave away a portion of his Matrix salary to the crew. Stories of Reeves’ generosity became so prevalent that by February 2018 they had morphed into a bit of an internet joke. Internet users started sharing outlandish and imaginary tales about how he had come to their unlikely rescue. 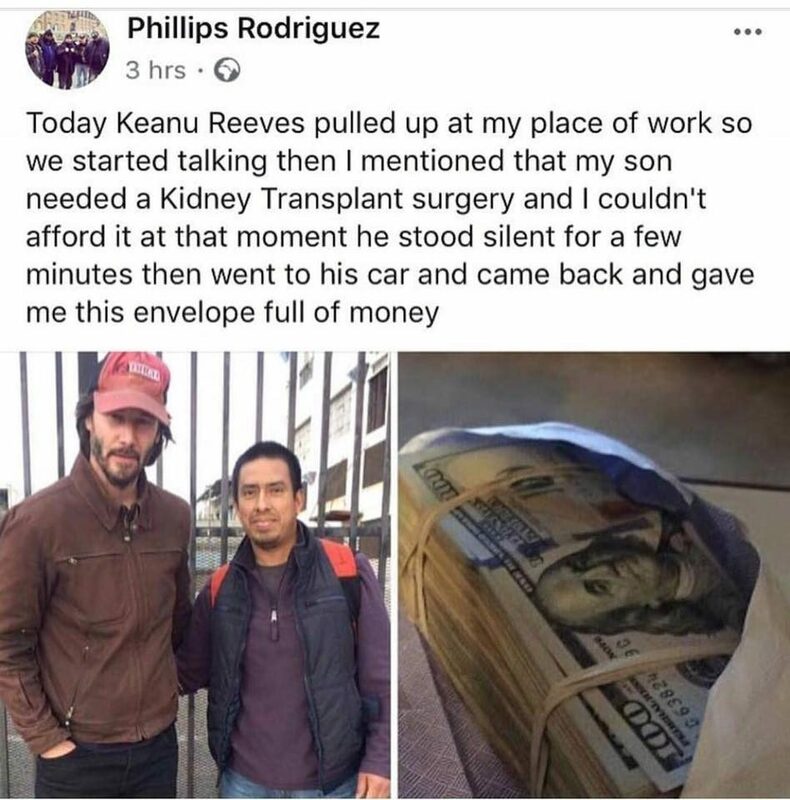 Today Keanu Reeves pulled up at my place of work so we started talking then I mentioned that my son needed a kidney transplant surgery and I couldn’t afford it at the moment he stood silent for a few minutes then went to this car and came back and gave me this envelope full of money. Both of these images predate this meme and are not related to one another. We haven’t been able to locate the exact origins of the photograph featuring an envelope full of cash, but this image has been circulating since at least February 2017, well before it was associated with a story about Keanu Reeves and a kidney transplant. Keanu Reeves’ off-screen life has proven to be a popular subject on the internet. In December 2016, for instance, a viral (and mostly true) video relayed some tragic moments from the actor’s personal life.